How is “Let’s Talk” different from the UCC? Counselors at the UCC provide counseling, which usually consists of bi-weekly 45-50 minute appointments. 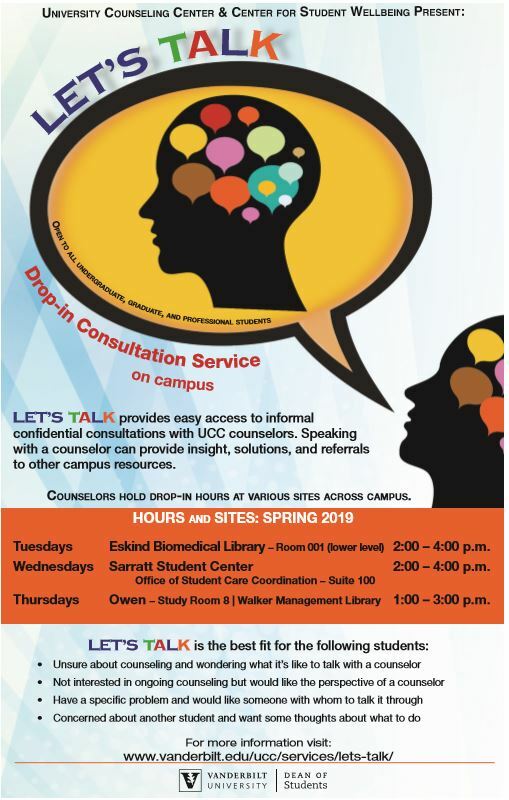 “Let’s Talk” is not formal counseling: it is a drop-in service where students can have an informal consultation with a counselor from time to time. I think I have a problem that would benefit from counseling, but I don’t know anything about counseling. Would going to “Let’s Talk” help me figure out what to do? Absolutely. The counselor will talk through your issue with you and help you determine the best way to get help. If you feel comfortable with the counselor, it’s sometimes possible to meet with them at UCC in an ongoing way. Although “Let’s Talk” counselors are professionals, “Let’s Talk” is not a substitute for psychotherapy or formal counseling and does not constitute mental health treatment. “Let’s Talk” counselors provide informal consultations to help students with specific problems and to introduce them to what it’s like to speak with a counselor. Your “Let’s Talk” counselor can help you determine whether formal counseling at the UCC would be useful for you and, if appropriate, assist you in scheduling an appointment. “Let’s Talk” visits are confidential. Are there any limits to confidentiality? Conversations with “Let’s Talk” counselors are confidential, with a few very rare exceptions. Counselors may need to share information in an emergency when there is an immediate threat of harm to self or others. Counselors are required by law to report when a minor, elderly person, or someone otherwise incapacitated and unable to act on his/her own behalf is being abused. “Let’s Talk” counselors keep brief written notes of their contacts with students, and in the event that there is an emergency or a student is referred to the UCC, other UCC staff may see these notes. Finally, these notes can be released in the unlikely event of a court order. “Let’s Talk” visits are never noted on a student’s official university record. We don’t want anything to be a barrier to students accessing help. If you have further questions about confidentiality, we encourage you to discuss them with a “Let’s Talk” counselor.